A PROPOSAL for a seven-floor block of shops and flats to replace the buildings at 75 Ridley Road, Dalston E8 2NP, is just the latest for the valuable site, which is close to a bus stop and a few hundred metres from two rail lines. This one, by Essex businessman Shad Shaikh, wants late-opening shops (midnight on Saturdays) with seven flats above them. The building would loom over the much-loved Dalston Mill Fabrics immediately west, at 69-73 Ridley Road. The plans are by Ellis Miller, a firm of architects at Gainsborough Studios near the Regents Canal at Shoreditch N1. Lovers of Ridley Road Market are already worried about a lack of consultation: no drawings or diagrams of the plans had been posted at time of writing. Local people accept that markets change over time but expect market traders and users to have a say in those changes. Ellis Miller describes itself as an award-winner specialising in “masterplanning” and commercial, residential, retail, hotel and education buildings, including the 2012 RIBA-awarded Catmose Campus in Okham, Rutland [Don’t worry, it’s England’s smallest county. — Ed.]. Chris Patience, of Ellis Miller, said: “Our proposals follow the council’s Dalston Area Action Plan, which aims to improve the public space in Ridley Road by maximising active frontages and creating a new square. 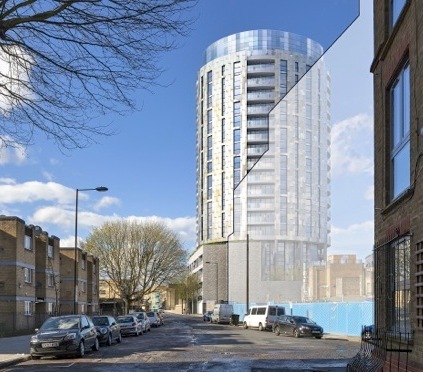 At the other end of the market another application has been made to build a sky-rise on the Peacocks site next to Dalston Kingsland station. The first attempt was exclusively reported by Loving Dalston in late 2011. Site owner Rothas has just applied to Hackney council for permission for a building of 19 floors, with 125 flats above shops. Rothas is known as a property investor rather than a developer, raising suspicions that if planning permission were granted, it would be sold on. Rothas’s public-relations adviser, Four Communications, tried to assure Loving Dalston several times that the proposal would go ahead. That firm is no longer handling the marketing. The plans replace an earlier application at the site, which included an 18-floor “eco-tower” and was rejected by the council last year. * UPDATE: The planning application for 75 Ridley Road, Dalston E8 2NP, 2013/2424, has been withdrawn. The application for 51-57 Kingsland High Street, Dalston E8 2JS, is 2013/2042. Thank you. I shall try to follow up on your information (the while keeping my views to myself). – Ed. In principle, the plans, at least for the seven-floor block, appear to be wanted by the locals, but more transparency (detailed plans, drawing, etc.) is sought, and that is reasonable. How a council could even consider ruling on planning for a sizeable development without that transparency is madness to me. Of graver concern, as in many parts of London, with the advent of skyscrapers, is what effect a 19-floor tower would have on the area in terms of shadow and its target market/purpose. Engaging with the local community is vital to ensure that planning is in sync with the wants and needs of those living there and is part of a beneficial long-term strategy for the area and not just a quick buck for each development as a standalone piece with no cohesion throughout the area. Thanks for posting. We must thwart all attempts to Brixtonize Ridley Road. This is one of the only few remaining places in Hackney where you can get a diverse range of food products. Along with Gillett Square, it is the true pulse of that part of Hackney that has not been invaded by your pop-pop, mono-race, over-priced, pretentious nonsense outlets which litter Kingsland High Street and beyond. OK, the street can do with a bit of a tidy-up, and who wouldn’t want to see a covered market, particularly during the winter, but essentially these plans, and the way locals and market people have been kept on the margins, point to a stitch-up in the offing in which property developers and councillors grab for themselves. One of Dalston’s three ward councillor needs your views. The Hackney North MP may also be interested. When the R word, “regeneration”, is deployed, as it is with this scheme, be on guard. — Ed.